Those who frequent home improvement stores have likely seen over-the-counter home mold testing kits. These kits are nothing but a scam. Spend your money on a DIY at-home mold kit and you will be burning through time, energy and cash. Though the makers of home mold test kits tout these alleged solutions as highly effective for identifying the presence of mold, the truth is these devices are rarely accurate. Unbiased parties who have reviewed these kits show their readings are wildly inaccurate and often completely false. Even if the results generated by the test are legitimate, you won’t know how to interpret them without the assistance of a mold specialist. You can purchase an over-the-counter mold test kit at the local home improvement store, perform the test and get a reading that indicates the presence of mold yet you will not know where it is located. You need a savvy mold removal specialist on your side to pinpoint the location of mold. This professional inspection includes sampling and an inspection for problems connected to mold that are not apparent to those unfamiliar with this toxic substance. Even the Environmental Protection Agency recommends for mold sampling to be done by mold experts. The labs that make home mold test kits typically lack certification. Furthermore, these groups are not endorsed by accredited agencies. Add in the fact that such kits lack documentation regarding acceptance by the lab and it is easy to see why the mold experts steer homeowners and tenants away from these supposedly accurate tests. Such documentation is typically referred to as the chain of custody. Often used in the context of debt collections lawsuits, the chain of custody describes the movement of the item in question from its original handler to the next party etc. The bottom line is these home mold test kits lack legitimacy in all regards. 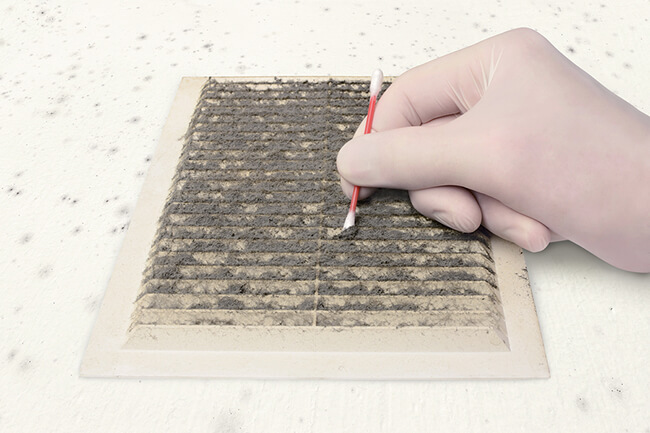 If you spot mold in your home, there is no sense buying a home test kit. Visible mold should spur an immediate removal effort conducted in accordance with industry guidelines. In the vast majority of cases, a DIY home mold test or a professional mold test will be unnecessary if mold is already visible. So don’t waste your money! DIY Mold Test Kits Do Not Expire and That’s A Bad Thing! Those home mold test kits at the local home improvement store do not have expiration dates. These alleged mold solutions will sit on the store shelf until they are sold or disposed of. This means the home mold test kit you pick up at the store might be several years or even a decade old. There is no way to tell the level of exposure or handling such a kit has had before bringing it home for use. Do not spend a single penny of your hard-earned money on an over-the-counter mold test kit! These kits are clearly flawed in numerous regards. Let our mold experts perform a professional mold test to determine if mold is present, determine how bad the problem is, where it is located and the cause. If you live in Northwest Ohio and Southeast Michigan, give Mold & Air Quality Professionals a call at (734) 755-3457. If you reside in Northwest, Lower or Central Michigan, you can reach us at (231) 679-2622.